"In every generation," say our sages, "a person is obligated to see himself as if he himself has come out of Egypt." Mitzrayim, the Hebrew word for "Egypt," means "boundaries" and "constrictions"; yetziat mitzrayim, "going out of Egypt," is the endeavor to rise above all that inhibits the soul of man, be it limitations imposed by an outside force, or the physical, psychological or spiritual limitations imposed by habit and nature. One of the most constricting elements of the human condition is the phenomenon of time. Time carries off the past and holds off the future, confining our lives to a temporal sliver of "present." But on the first night of Passover we break the bonds of time, having received a mandate to experience the Exodus "as if he himself has come out of Egypt." We recall the Exodus in our minds, verbalize it in the telling of the Haggadah, digest it in the form of matzah and wine. As we passover the centuries, memory — those faded visages of past that generally constitute our only answer to the tyranny of time — becomes experience, and history is made current and real. 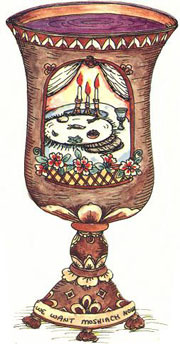 Passover is an eight-day festival, with two opening and two closing days of heightened observance and commemoration (Yom Tov). While the theme of redemption runs as a current through the entire festival, the first days of Passover focus primarily on our first redemption — our liberation from Egypt thirty-three centuries ago—while the closing days highlight the final redemption — the future era of divine goodness and perfection heralded by Moshiach. On the first two nights of Passover we conduct the Seder, reliving our redemption from Egypt in the telling of the Haggadah, the eating of the matzah and the bitter herbs, and the drinking of the four cups of wine. On the seventh day of Passover, we read the "Song at the Sea," which contains an important allusion to the Messianic era; on the eighth day, the haftarah (reading from the Prophets) is from Isaiah 10:32-12:6--one of the primary prophecies on the future Redemption. Rabbi Israel Baal Shem Tov, founder of the Chassidic movement, instituted the custom of partaking of "Moshiach's Feast"--a mirror seder of sorts that includes matzah and four cups of wine—on the afternoon of the eighth day of Passover. Thus on the latter days of Passover, our transcendence of time enters a new, heightened phase: it is one thing to vitalize memory to the point of actual re-experience, but quite another to make real an event that lies in the future, especially an event that has no parallel in the history of man. Yet in the closing hours of Passover, we enter into the world of Moshiach. Having vaulted over millennia of past on the seder nights, we now surmount the blank wall of future, to taste the matzah and wine of the ultimate redemption. Why Matzoh and Wine? In this another article on this website, entitled, The Eighth Day of Pesach: The Feast of Mashiach, we find, "The tasteless flatness of matzah symbolizes selfless humility, a desire to transcend oneself. Wine, by contrast, is flavorful and pleasurable, and thus symbolizes the assertiveness of our individual personali­ties. Combining matzah and wine in Mashiach’s Seudah teaches us that self-transcendence does not require that we erase our personal identities." Matzah and Wine of the Ulltimate Redemption As Pesach nears its conclusion, Matzoh appears to be the bread of affliction. Why would one envision Paradise as eating Matzoh and Kosher sweet wine?